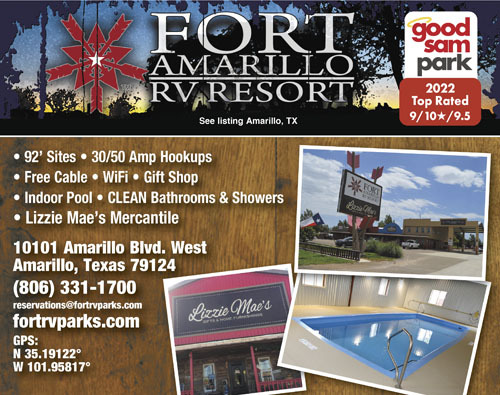 Nice established RV Park on west side of Amarillo. Pull-through gravel pads, low fences between sites, trouble-free utilities. Good WIFI and cable. Inside pool, workout room, duck pond, nice laundry and restrooms. On-site home craft store. Very helpful office personnel. Overall nice stay. Would return. OMG... with a 10* rating we thought we’d be in a nice park... the place they put us was all the way in the back (trashy and squalid was a more appropriate discription! The site was gravel and very un level! The full time residents were where they put us for the night. Nothing against long stayer’s however they need to clean up the grounds. Poorly maintained grounds in their back 40... and poorly planed streets such that leaving the place was a hazard as no designated direction so you could have to back your rig if another rig was coming down the lane. I really can’t say about the on site amenities as we were so far away from them.bad is all I can say and I will never return even tho I had no interaction with the workers or owners. It’s just too trashy and in need of maintainance. Really enjoyed our stay here. Easy check in. Very helpful staff. Terrific Gift Shop. Clean and quiet park. Very pet friendly. Close to restaurants and sites. Our visit to Palo Duro Canyon was exceptional--a must see in the area. Just be prepared for the TX wind!! Neat place! Great playground for kids with lots of great green grass, AMAZING dog park, best I’ve EVER seen, grass and trees. My dog loved it. Indoor pool, very comfy. Spa was removed and they are putting in another. There’s a storm shelter with a great game room with billards, pingpong, foos ball, air hockey and a nice table and chairs. I see a great place for 16 yr olds to get away from their folks. There is a great work out room and the nicest showers/restrooms I’ve ever seen. Very spa like. The whole room is very private with locking door. I am self contained and don’t use those facilities, but I would definitely use them if I needed. Sites are spacious, and well laid out. The park itself is surrounded with some industrial ugly, and is close to the road, but that can’t be helped. There is the gift store to end all gift stores onsite. Spend an hour just looking at all the stuff. Do your Christmas shopping. Office was VERY friendly and helpful, cable is great and the holy grail… good wi-fi. Paid $37 with Good Sam. That’s above my budget normally, but this place is worth it. It is a Resort, albeit a bit older. 3 bubbles ATnT service. Booked this park for 3 nights and left after 1. The site was spacious enough and hooks-ups worked fine but the smell of urine and feces was just too much. People let their dogs roam freely to do their business wherever and don't pick up after them. Woke up in the morning and opened the door for fresh air, left within the hour because of the smell, a dog had pooped right at our door. Did not use the bathroom/shower or laundry. Park is run down and over run with full timers, the 9 1/2 mph speed limit is totally ignored, lots of dust with the speeders on the dirt road. I would not recommend this park. This park was adequate for an overnight stay but was not very appealing. There were many permanent residents with at least one living in a van. The pads were gravel with a small concrete area with a picnic table. The gym was substandard and the overall appearance of the park was marginal. 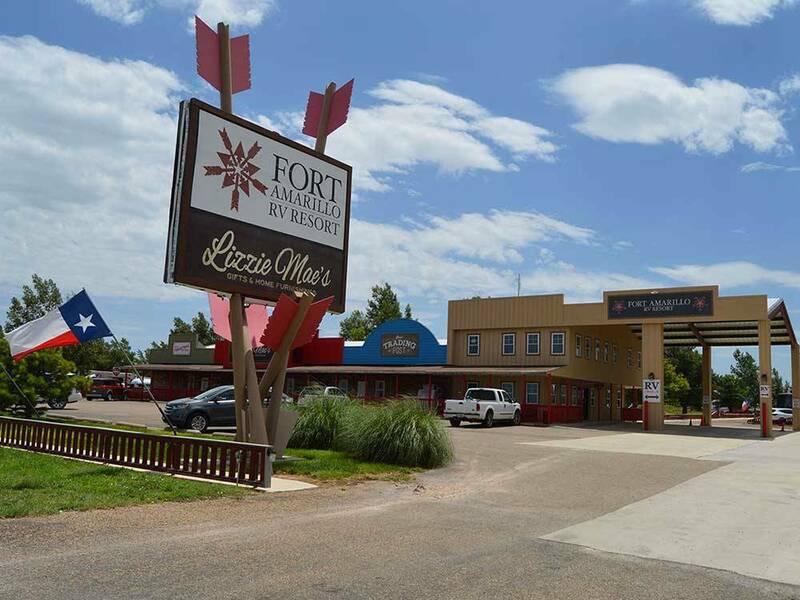 If you are going to visit Palo Duro Canyon, this is the place to stay. The Canyon is only a 25 min drive from the RV park. The pull thru sites are big and spacious. We travel with a 35 ft 5th wheel and had no problems menuvering thru the park. The restrooms located in the building where the swimming pool is are very clean. The staff is very friendly and helpful. Great place to stay! I can't say enough wonderful things about this park. Family owned & operated. Planned a 2 night stay. After our first night we needed to make a trip to the emergency room and required an extended stay. They were so concerned and accommodating-had to move things around so we could stay and did so with no hesitation. The park is great - very wide, level spaces, excellent layout, very well maintained. There is an onsite gift shop that is way better than any we had seen on our trip (better than Cracker Barrel). We highly recommend this park for an wonderful stay - and to know that they will do anything to help when something goes wrong. Stayed one night traveling through Amarillo. A really nice, clean park that is close to I-40 but far enough away that you don't get the traffic noise. Didn't use the showers but the restrooms were nice. We would stay here again. This is the second time we have stayed. They keep making improvements. Nice, clean, quiet place to rest. Very level gravel sights. Staff was really friendly! Well located to restaurants if you decide to eat out. Friendly staff. I was traveling alone and appreciated having a site close to the office. Site was level with patio and table. Worked well for an overnight stay. Did not use restrooms or other facilities. Nice level sites separated by tasteful fencing. Full hook up. WiFi and Cable. Roads a bit uneven. Traffic noise apparent. Great dog park. Friendly staff. Great theme. Stayed overnight for 2 nights. I had the opportunity to tour this park several months before our scheduled arrival date, and I was thoroughly impressed. Excited for our trip back out here later. Wonderful staff and great facility. Spots are easy-in and easy-out pull throughs. Stayed here on our way to California - wonderful experience so we stopped here on our way back as well. They were in the process of remodeling their reception/check-in area in August and expected to be done in the fall. Nice portico to pull under as well for checking in. Nice RV Park. Facilities were very nice. Road in was a little bit rough. Cattle smell was very bad with the wind direction. Bathrooms were ok for overnight. Open bay concept 2 showers, sinks, and toilets. There are four private bathrooms but need updating. Pull through sites loose gravel. Water, elect, and sewer connections a little worn. Need extensions for sewer and water connections. Wide RV spacing. Pool was clean, but the carpet around the poll needs replacing. Hot tube is out of order and has been for two years. Park lost power and was fixed within an hour. Gym machines need replacing treadmill is worn out and a little dangerous. Awful! stock yard smell was over whelming during the night and the next morning. We will NEVER stay there again. The spaces are level but cramped. Not my idea of 'camping'. 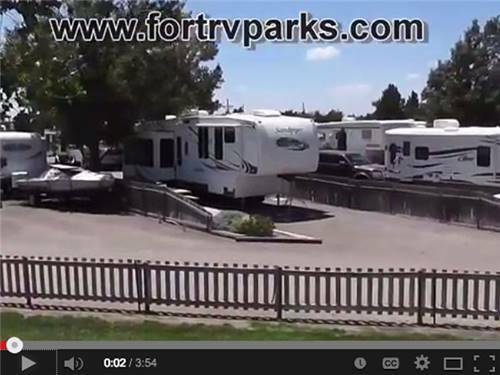 Nice RV park. Spent the night.